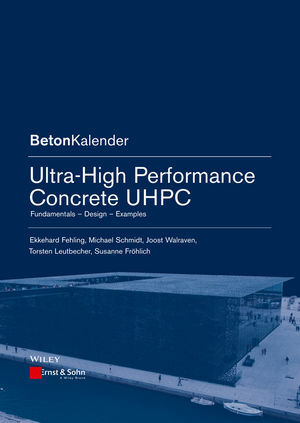 This book is a comprehensive overview of UHPC - from the principles behind its production and its mechanical properties to design and detailing aspects. The focus is on the material behaviour of steel fibre-reinforced UHPC. Numerical modelling and detailing of the connections with reinforced concrete elements are featured as well. Numerous examples worldwide - bridges, columns, façades and roofs - are the basis for additional explanations about the benefits of UHPC and how it helps to realise several architectural requirements. Univ.-Prof. Dr.-Ing. Ekkehard Fehling studied civil engineering and gained his doctoral degree at TU Darmstadt in 1990. In 1993 he was awarded the IABSE Prize (International Association for Bridge & Structural Design). Since 1997 he has been a licensed checking engineer for structural design in concrete and steel. In that same year he was appointed professor of concrete construction at the University of Kassel, Institute of Structural Engineering. Univ.-Prof. Dr.-Ing. habil. Michael Schmidt studied civil engineering and gained his doctoral degree at TU Hannover in 1977. After 20 years of R&D in the German cement industry he served as professor of construction materials at the University of Kassel, Institute of Structural Engineering from 1999 to 2012. Prof. Dr. ir. Dr.-Ing. h. c. Joost Walraven studied civil engineering and gained his doctoral degree at Delft University of Technology in 1980. For five years he was professor of concrete technology at TU Darmstadt, and since 1989 he has been professor of structural and building engineering at TU Delft. He is honorary president of the International Federation for Structural Concrete, fib. Univ.-Prof. Dr.-Ing. Torsten Leutbecher studied civil engineering and gained his doctoral degree at the University of Kassel in 2007. For six years he was a research associate at the University of Kassel, Institute of Structural Engineering. In 2014 he was appointed professor of structural concrete at the University of Siegen. Dipl.-Ing. Susanne Fröhlich is a research assistant at the University of Kassel, Institute of Structural Engineering.